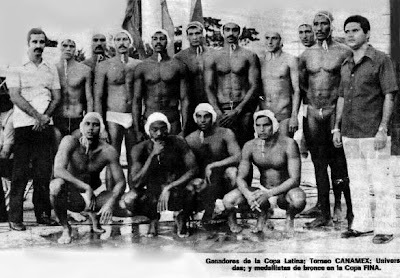 The National team of Cuba, winner of bronze medal in the 2nd FINA cup of Long Beach, USA in 1981. In the same year Cuba won the gold of the 1st " Coppa Latina" held in Santiago Chile. The team coached by Juan Almeneiro: Oscar Periche, Orlando Cowley, Barbaro Diaz, Lazaro Costa, Pedro Rodriguez, Nelson Dominguez, Jorge Rizo, Arturo Ramos, Carlos Benitez, Gerardo Rodriguez, Oriel Dominguez.